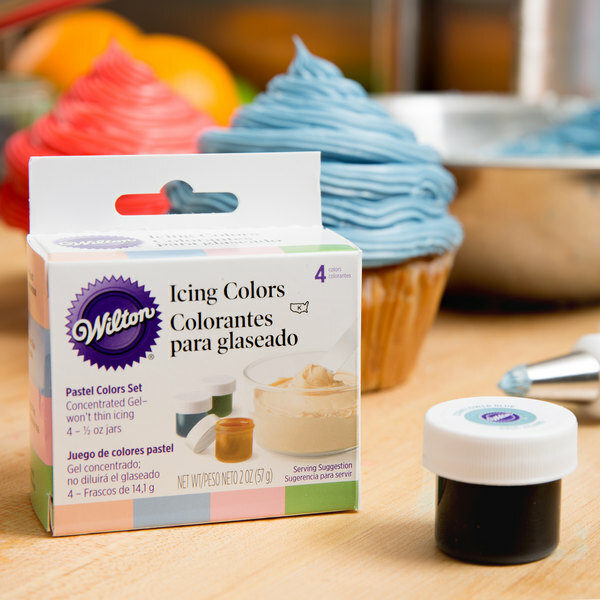 Add soft pastels to your icing or fondant with these Wilton 601-25588 gel food colors! Featuring a smooth gel consistency, these food colors will help transform your baked goods and birthday cakes into colorful sweet treats. This food color pack includes 4 different .5 oz. bottles, providing you with a range of colors and creative possibilities! Combine with piping gel, icing, whipped cream, fondant, and more to make truly unique and decorative designs. This concentrated gel food coloring allows you to use less product at a time than traditional water-based food coloring to achieve the same color effect! Just a small amount adds vibrant color, and it will not thin out or alter the consistency of the icing itself. Use this gel food color to help boost bakery profits with a variety of colorful holiday or special event-themed treats. These pastel colors are perfect for decorating baked goods with roses, flowers, and delicate designs. Additionally, the colors will complement baby showers, weddings, and Easter-themed desserts! Use the colors individually or mix them together for new shades. They're sure to add creativity and color to anything you make! This item is certified Kosher by the U.S. Kosher Supervision. The pastel gel colors are the perfect shade for what many clients like for smash cakes and baby showers. I prefer to have the shade of gel coloring as close of a match to the desired food color so I don't have to worry about adding more of less of a darker shade. The gel food color comes in a scree top so to add color i sticks butterknife in and then spread it in my buttercream frosting mix. I love these! I use them in cake batters, buttercreams and royal icings. The color shows up well and it does not impact the consistency of my product. I highly recommend. Loved the colors. They are very, very concentrated and a little goes a long, long way! The blue was perfect for the shade of periwinkle I needed for cupcakes for a bridal shower. Perfect colors, if you use a little at a time it will come out nice and pastel. If you use to much you will need to add more buttercream or fondant. The Wilton pastel gel food coloring make the softest and prettiest icing for spring and baby showers. The coloring is amazing and mixes in well for fabulous colored frosting. The Wilton Pastel Gel Food coloring pack is lovely. The pastel colors are gorgeous and add a special touch to all of our creations. I highly recommend! This gel food color is really really strong. It depends on the usage what color you come out with. Just because it says pastel and there are swatches doesn't mean you will get that color...Use lightly. I love the pastel food coloring. Its great for making my own colors with frosting for beautiful flowers on cupcakes and cakes and very affordable! These colors are so beautiful. They do get darker a few hours after mixing so make sure your frosting is lighter than the desired colored. I no longer use food coloring in decorations for baking. The Wilton line of gel food colors offers many great colors and you can add more or less to create new colors or get a different shade. The gel does not alter the consistency of the icing so it is my go-to. An awesome set of pastel gel food colors that is great for our bakery. The color pallet is awesome and the colors are subtle and pretty. Great for baby shower cakes and cookies. A nice soft, set of pastel gel food colors that are great for creating baby cakes. The colors are so light and subtle and really awesome. The colors are extremely pigmented a little definitely goes a long way. The colors are very pretty for the spring time or for baby shower decorations. A great decorating tool that is a really great price. 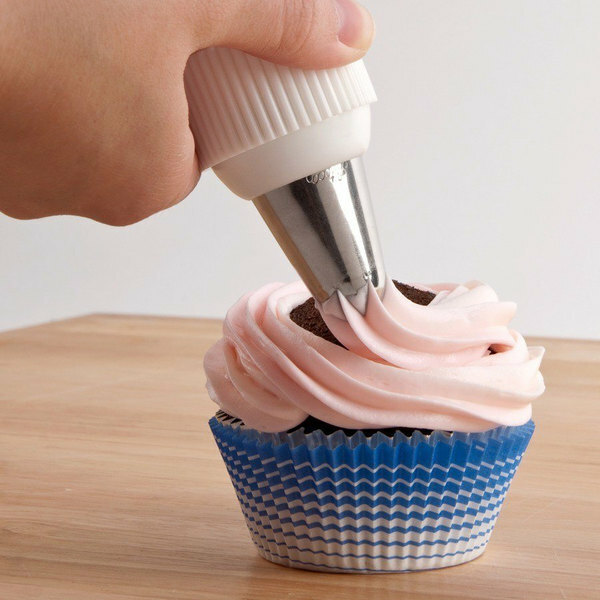 It is perfect for decorating cupcakes and cookies. The pastel gel food colors are great for Easter and Spring cupcakes. I could not find these Pastel colored food gels anywhere, only the primary colors. I have already put these to the test for an upcoming gender reveal party and they are truly to color. Absolute great purchase. A great set of subtle, pastel good colors that are great for dying our fondant. I like to dye my own fondant to achieve the exact color I am wanting. The gel makes the fondant the perfect color without making it runny or slimy. I have a bunch of these Wilton Gel paste colors. They work amazingly well for royal icing and fondant. However, if you need to achieve deep shades in your fondant, these will not be great. They soften up the fondant if you need to add a lot of color. This Pastel Gel food colors just perfect if you want light pastel colors. It only takes a couple of drops to have pastel colors. More to it, you have clean and pretty icing. 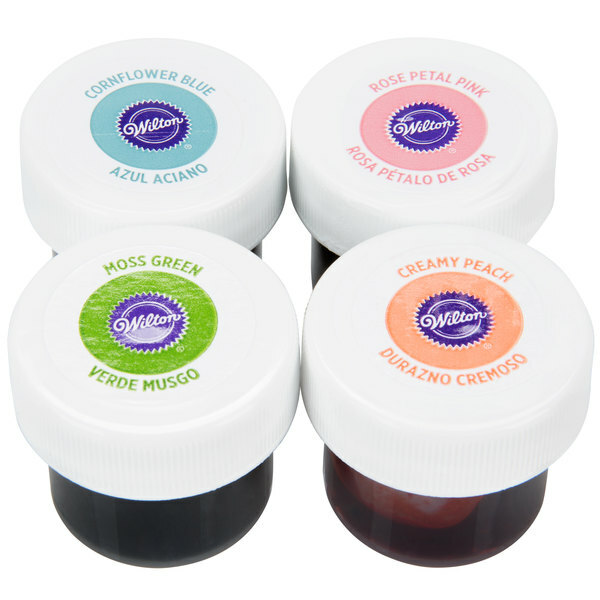 Wilton gel food dyes are always the best! It takes only a small drop to achieve bright, vibrant colors in any of your cakes and frostings. Gel food colors are the only food color I will use in my royal icing, meringues, and frosting. You can get great colors from just a dab of concentrated gels. Witlon food color is great and this pastel set has lovely, delicate colors. These are nice pastel colors. They work well for creating the look of spring flowers, baby shower cakes, and so much more. They also don't add taste or water down to what they're added. Beautiful colors! The little bottles are just the perfect size and a little goes a long way. Very pleased with my purchase. 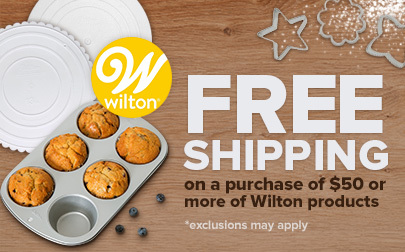 Perfect for my macaroons and other baking needs. I love the wilton gel colors. The blend so nicely into icings and fondant. They also color batter very well. I especially like this combo of colors because the blue and peach colors are hard to find individually. 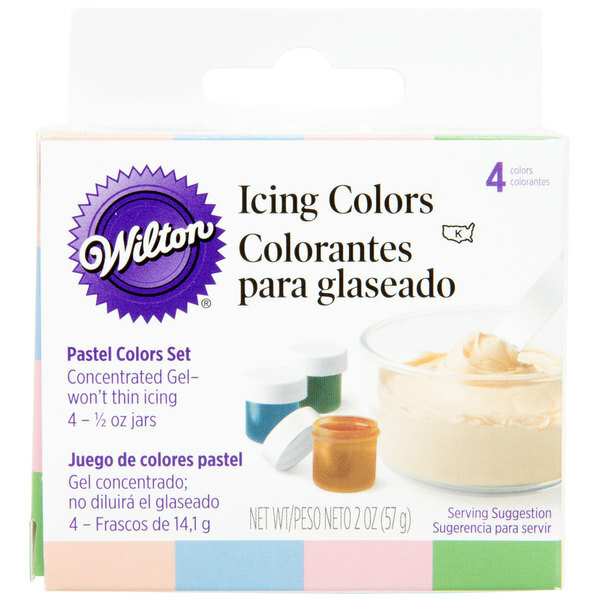 This is a nice set of pastel gel colors by wilton. There are 4 different colors, and they come in screw top jars. I use these for coloring my icing and fondant.